I can remember the first time I read The Thirty Nine Steps. I was thirteen and was immediately hooked. Over the course of a single weekend, I devoured all five of the novels that featured Richard Hannay. As part of my Classics Club list, I’ve recently re-read it to see if my views have changed. 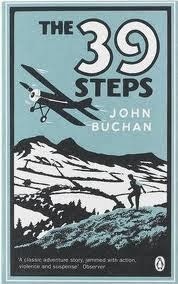 Written in 1915 and set on the eve of the First World War, The Thirty Nine Steps was the first of John Buchan’s novels to feature Hannay, a Rhodesian mining engineer who has returned to the old country having made some money. Having become somewhat bored with the London scene, Hannay gets involved with a peculiar, self-professed spy, Scudder, who claims to have secret information about a nefarious plot to assassinate a Greek politician, Karolides, in London and cast Europe into war. Hannay gives Scudder shelter in his flat, only to find him murdered there some days later. Driven both to avoid being arrested for Scudder’s murder and to stymie the plot, Hannay escapes to the Highlands, pursued by police and plotters. Of course, after a string of exciting escapades, Hannay solves the mystery, thwarts the plot and saves the day, enabling Great Britain to enter the First World War still in possession of its military secrets. On a re-reading, I could immediately see why I loved it so much as a child. It’s incredibly fast-paced with plenty of action and a series of mini-cliff-hangers. Hannay is drawn as an uncomplicated and old-fashioned sort of hero, thoroughly decent, dashing and brave, with a stiff upper lip and a willingness to “play the game”. By contrast, the Black Stone are evil and deceitful, the worst kind of baddies. “I got the first hint in an inn on the Achensee in Tyrol. That set me inquiring, and I collected my other clues in a fur-shop in the Galician quarter of Buda, in a Strangers' Club in Vienna, and in a little bookshop off the Racknitzstrasse in Leipsic. I completed my evidence ten days ago in Paris. I can't tell you the details now, for it's something of a history. When I was quite sure in my own mind I judged it my business to disappear, and I reached this city by a mighty queer circuit. Now it may be thirty years since I first read it, but I haven’t really changed all that much. I still like a good adventure story, still love the idea of the amateur spy lurking in dark and exotic corners of the world and remain partial to the atmosphere and style of pre-WW1 Europe. So I should still have enjoyed The Thirty Nine Steps. “The capitalists would rake in the shekels, and make fortunes by buying up wreckage. Capital, he said, had no conscience and no fatherland. Besides, the Jew was behind it, and the Jew hated Russia worse than hell. I’ve commented in the past about seeing distasteful and outdated views in literature in the context of the time the relevant book was written but, for some reason, the appearance of overt and casual racism in The Thirty Nine Steps gave me a far stronger emotional reaction than equally abhorrent views in books that I liked less. Maybe it is that juxtaposition of an old favourite novel with views with which I disagree so strongly. In any event, The Thirty Nine Steps remains a classic adventure story that I found still enjoyable but far less so than it was thirty years ago. It's only since I started reading blogs that I learned this is an actual book, not just a film or TV script! I came across a used copy not too long ago & added it to the TBR stacks.